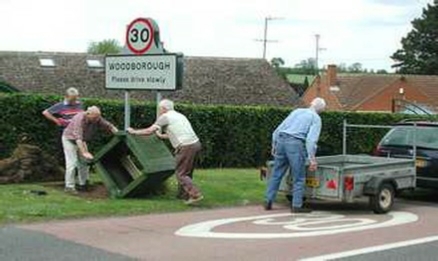 Woodborough, a village of approximately 1800 residents. 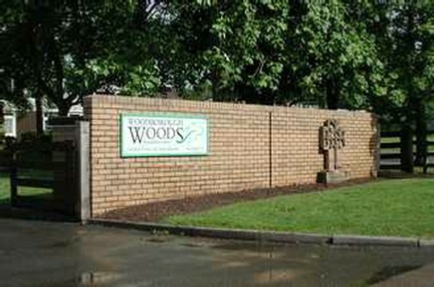 Woodborough is 8 miles northeast from the City of Nottingham. The area enjoyed a reputation for market gardening until recent times and is still well known for growing roses on a commercial scale. 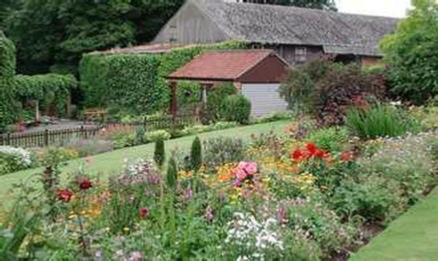 The village Horticultural Society stages four shows a year and there are 24 allotments all occupied. 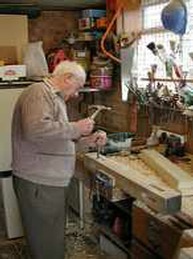 Almost without exception the residents are keen gardeners and many reach a very high standard. Several of these open for charity and raise considerable sums each year. 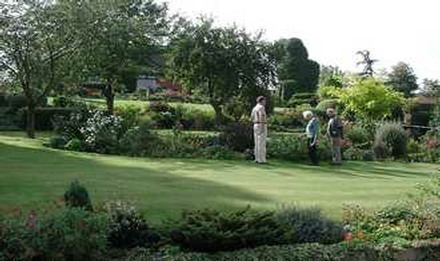 The village can boast from within its ranks the only garden in the East Midlands to reach the regional final in 1999 of BBC2’s Gardener of the Year competition; the same garden was also featured in the ‘The Amateur Gardener’. Woodborough is within the Gedling Borough Council area that operates an efficient recycling policy for glass, newspaper, and plastic, all collected on a fortnightly basis from the home. 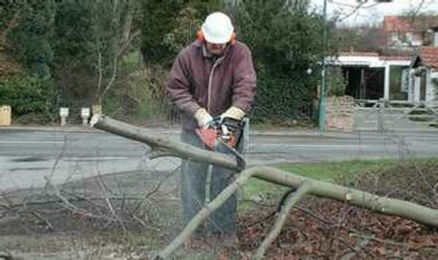 In addition there is a voluntary Green waste collection service, also on a fortnightly basis, for which residents pay £26 annually. Currently  GBC has 79 subscribing members in the village. 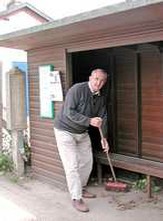 The village is justly proud of its beautiful location and the Parish Council achieves much with its ‘hands on’ approach to tidiness and upkeep. 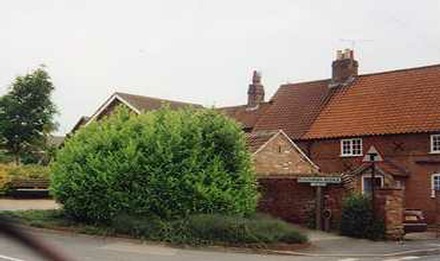 Left Ploughman Avenue and right Smalls Croft before clearance of old shrubbery autumn 2004. 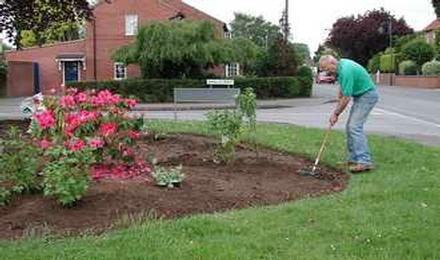 Gedling Borough Council has had full responsibility for the above beds, Ploughman Avenue on the left and Smalls Croft right. But as these photographs show, there was little imagination in the perennial planting, thus creating an eyesore. 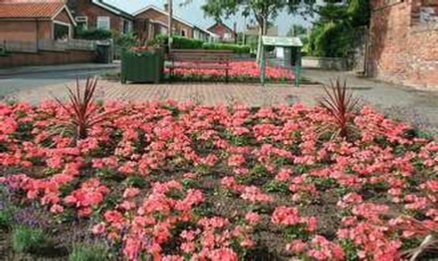 On entering ‘In Bloom’ representations to the Council allowed our taking over these major focal points for our own planting schemes. 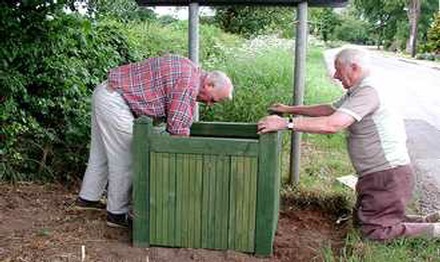 A local joiner has made seven planters to professional standards; all have been sponsored and planted by village organisations. Six planters have been positioned by the five roadway entrances to the village, the seventh on the Ploughman Avenue site. 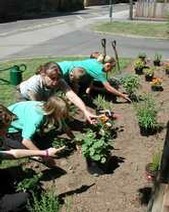 The village school has long had an interest in wildlife and this is being actively encouraged with their wildlife garden. Additionally, a prominent public area in front of the school has been planted by the pupils having first researched the suitability of plants for their site. 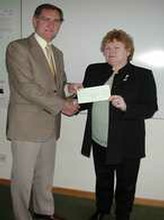 Funding, Scheme and Sponsorships: Funding: Nottinghamshire County Council has generously provided funding of £1,700 and NCC Councillor Mrs Carol Pepper (left) handed over a cheque for this amount to Woodborough In Bloom Chairman, Paul Reed. Scheme: Plans were drawn for 7 planters to be positioned at the 5-roadway entry points into Woodborough and 2 major replanting schemes at Ploughman Avenue and Smalls Croft. 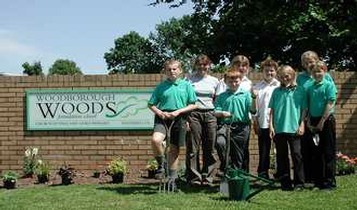 A smaller scheme, but none the less just as important, the children of Woodborough Woods Primary School are to complete their own contribution with a small garden in a public area in front of the school on Lingwood Lane. Floraland Garden Centre Lambley - the Lingwood Lane planting. 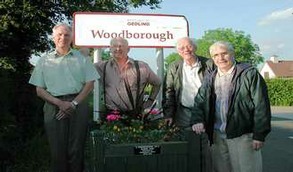 Publicity, local and regional: There have been six postings in The Woodborough Newsletter (left) appearing between December 2004 and June 2005; they were published on the following months, December 04 then February, April, March, April, May and June 2005. 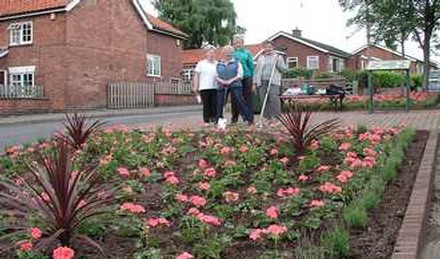 There is no doubt that this has generated local awareness on 'In Bloom' and encouraged participation by Woodborough residents. Newspaper coverage is also important. It brings to a wider public attention this kind of initiative, both to inform and to encourage. 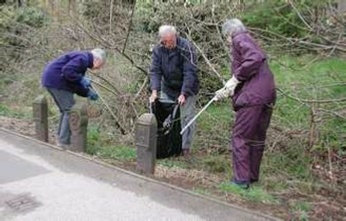 Improving the environment in which we live makes people feel better about themselves and even if some may not be able to take an active part, they may add their encouragement to those that do. 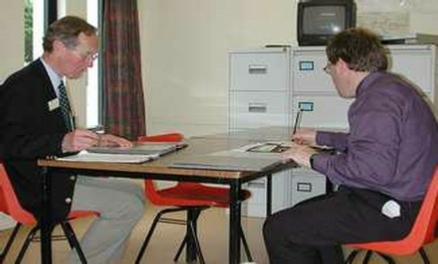 The following regional press clippings (below right) are from the Newark Advertiser and the Nottingham Evening Post June 2005. Below Left a summary of Local coverage. 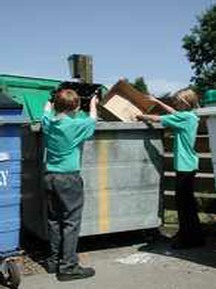 Woodborough Woods Foundation School Recycling Scheme: The school has had a recycling scheme for many years; this was in addition to a recycling scheme run by Gedling BC from the adjacent Village Hall car park. This latter scheme was removed in January 2005 due a change in the way the Borough Council collects household waste from the ‘doorstep’. redundant material, and right, proudly hold the School’s recycling trophies. 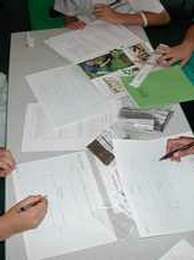 The school scheme continues as before by encouraging anyone, not just school users, to recycle cardboard and paper products, aluminium cans and clothing. 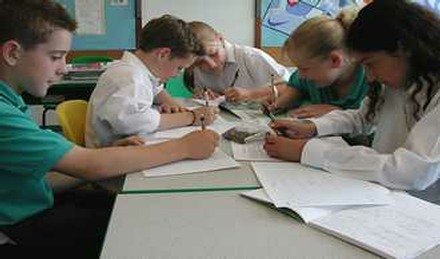 In Spring 2005 the school won two awards for their effort in raising £214, which was the largest amount across the county. With these funds new furniture was purchased for three classrooms. Ploughman Avenue: This site was cleared of overgrown shrubbery in March 2005, then rotavated, and finally, the soil was prepared by the addition of manure. 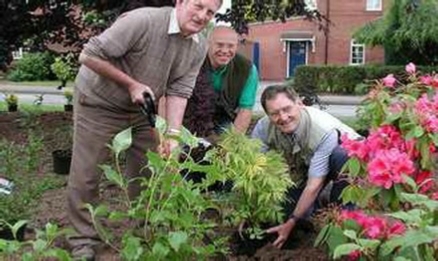 Planting took place on Monday 6th June 2005 with a scheme of lavender for the borders and geraniums filling the centre. 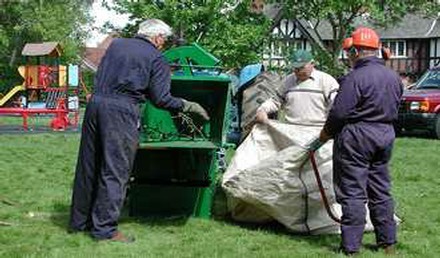 Paul Reed with Robert Hanson (above left and above right) spreading the first load of ‘muck’. 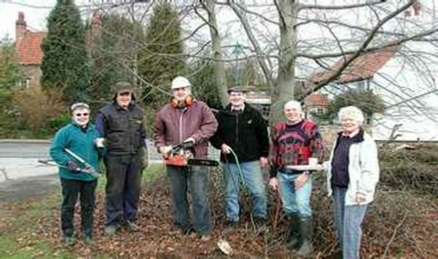 Re-planting helpers with Paul Reed included, Rosalind Kirk, Anne Reed, Juliet Moss and Chris Brooks. 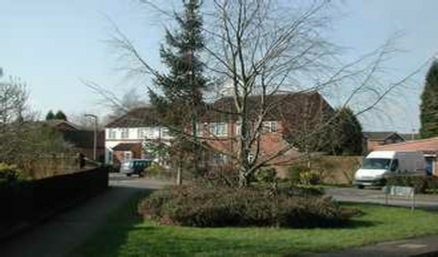 Smalls Croft: During March 2005 the redundant shrubs were removed; the lower branches of a copper beech tree were cut off to allow improved vision for drivers and increase the light for the new plants. 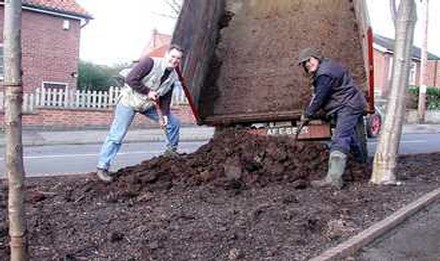 The soil was then manured and rotavated. Re-planting took place in June 2005. Site clearance of Smalls Croft March 2005: Helpers with Paul Reed on this site were, Chris & Phil Brooks, Robert Hanson with tractor, John Hoyland, Judith Ramsden, David Burgess and Geoff Hallam. 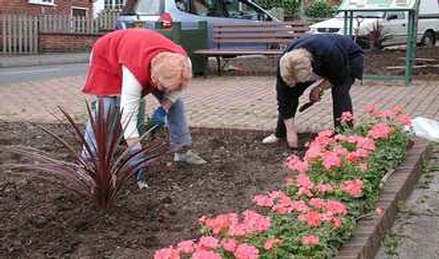 Then Re-planting with summer flowering shrubs June 2005. Litter: Absence of litter throughout the village is vital in generating points for 'In Bloom' as well as creating a better environment for residents. Featured here the garden of a derelict house on Main Street which was subject to wind blown rubbish; a small team of volunteers cleared this to leave the site litter free. A bus shelter on Main Street was also in need of tidying up. 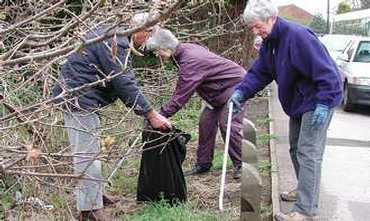 Residents Pam Footitt, David Rose & Juliet Moss removing litter from a derelict garden ‘The Yews’ on Main Street and John Hoyland (centre) clearing rubbish and weeds from a bus shelter directly opposite the Ploughman Avenue site. 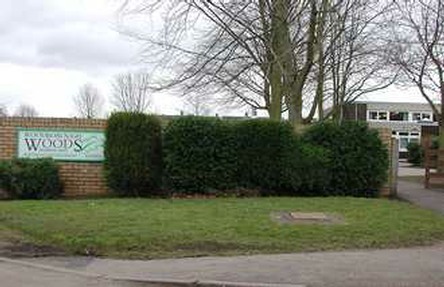 Woodborough Woods Foundation School: Year 6 children from the school have transformed an uninteresting area next to the Lingwood Lane school entranceway. There was an overgrown and redundant conifer hedge that first had to be removed by a local farmer; this revealed a stone cross from ‘the old 1878 school’. The soil was then rotavated. 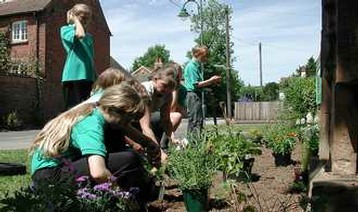 Finally the children have planted this area having first researched the soil type and suitability of the chosen plants. Above left and right, the site before and after clearance. The children's project (seen below) was to fully assess the site by taking measurements, soil analysis, preparing the soil, and selecting suitable plants from books and magazines, setting out then planting, and finally learning about aftercare by watering and feeding. Above left and right, classroom assistant Tracey Akehurst with her team of year 6 gardeners. Grace Walker, Stefan Haest, Fiona Mellink, Adam Redgate, Beth Tyas and Thomas Henderson. From their plans the children are spacing out before digging holes for the plants. 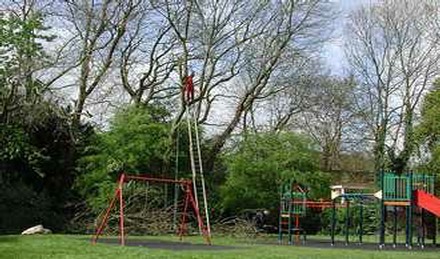 Governors’ Field: On 13th May 2005 several tall over-hanging trees were cut back to improve the light and safety for the children’s play area. Some members of the Parish Council were involved with the work on this site. 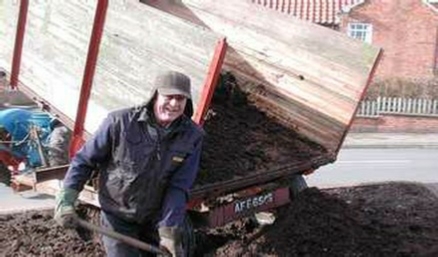 Left Ray Robson a local farmer with Robert Hanson cutting back. Right Robert Hanson, Brian Leafe & John Harlow. Robert & John representing the Parish Council, Brian is vice-chairman of Woodborough Community Association. 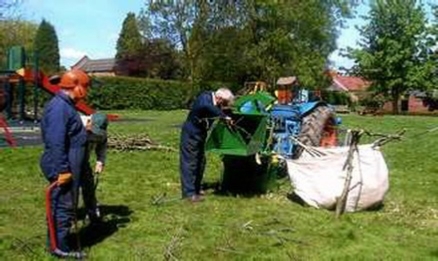 Governors' Field is right at the heart of the village and is owned and managed by the Parish Council, they maintain it for the benefit of the community. It is an open focal point for the community and therefore has immeasurable value to the village. As well as having children's play equipment it also has the village beacon and the village sign. During the year the 'Field' is the scene for several social events, including the Street Market and the annual open air service. 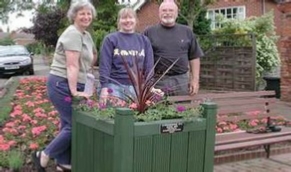 Planters: Estimates were sourced from several joinery firms, but local joiner, Barry Sawyer, provided the design and his labour free, thus making a saving of several hundred pounds for the Woodborough in Bloom committee. 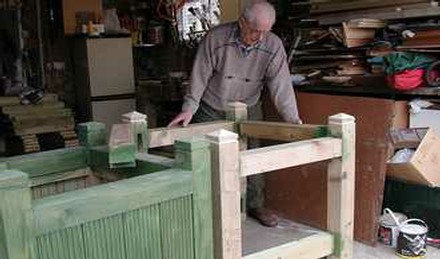 Above: Barry Sawyer in his workshop beginning of May 2005 during the early stages of planter construction. It took Barry about one month to make all 7 planters. 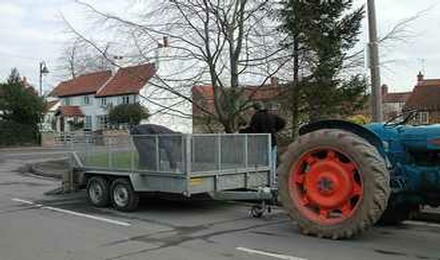 Below: Early June two of the 7 planters being manoeuvred into position, the one on the left on Lowdham Lane by Brian Harris with Barry Sawyer and on the right on Bank Hill, Peter Frost, Brian Harris, Terry Robinson with Barry. A garden of inspired planting and highly visible front garden: There is no doubt that Jack & Dot Kirkham's garden on Bank Hill was a worthy candidate for this award, the garden is both colourful, with a wide variety of shrubs, trees and perennials carefully arranged to maximum effect. The garden slopes upwards and away from the road and all of it is clearly visible. Below, two views of their beautiful garden. 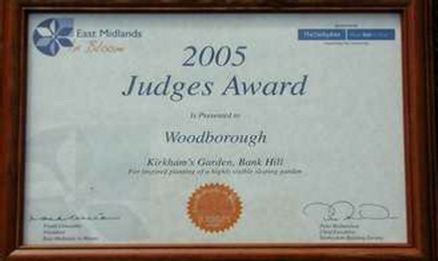 Judging: The judging of Woodborough in Bloom 2005 took place on 7th July 2005 when judges, Richard Tomlinson and Mel Henly arrived. 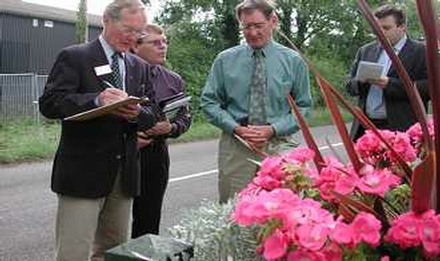 An action plan was carefully orchestrated by Paul Reed who directed them around the village to view and judge the various projects; these included the 'gateway planters', Ploughman Avenue, Smalls Croft, planters in the Pinfold and at the entrance to the Village Hall, Jack & Dot Kirkham's inspirational garden. 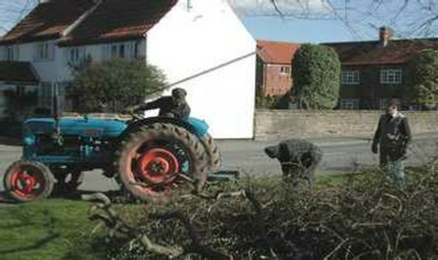 They saw a brief video taken from the Village Video and also perused the Portfolio created by John Hoyland. We were certain they left with a good impression, but how good we had to wait until 7th September when the results were announced at The Guildhall in Northampton. Judging taking place in various parts of the village. 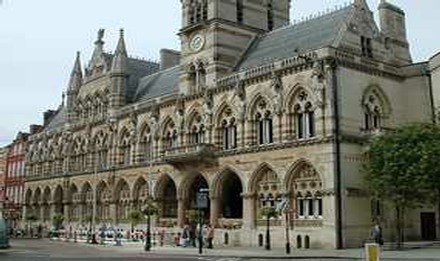 The awards ceremony took place on 7th September 2005 at The Guildhall Northampton, a fine building with a very unusual civic hall. 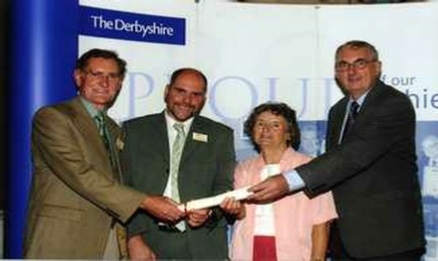 Those representing Woodborough were Paul Reed, Edwina Pogson and John Hoyland. There were many categories to get through before our section, 'Large Village', the excitement was building with the results being given in reverse order. There were eight other entries in our section and we had to wait until the sixth name was called out to announce we had received 138 points and A Silver Award, this put us into third place behind Market Bosworth (a seasoned 'In Bloom' campaigner) with 170 points and Barlborough second with 143 points, but in front of Meden Vale with 128 points. On the left the Northampton Guild Hall. Right Paul Reed with Edwina Pogson and John Hoyland. Also announced was the Judge's award for 'an inspired garden' and that went to Jack and Dot Kirkham for their inspirational garden on Bank Hill, they received a certificate from the Judges through Paul Reed. It would be an understatement to say that we were delighted with the results and this spurs us on for our second attempt in 2006. Jack & Dot Kirkham's excellent garden, on the right the certificate they received. Woodborough (3rd): Silver Medal Certificate - 138 points. for inspired planting of a highly visible front garden. 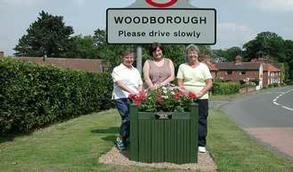 We were very pleased indeed to have the privilege of visiting Woodborough on your first entry in the East Midlands In Bloom Competition. It soon became very clear to us that you had researched the criteria well and came up with a splendid entry. Well done! The following are our comments that we trust will be helpful to you in doing more to further improve your lovely village. Section A - Floral displays. (1) Impact (2) Residential gardens (3) Special floral features including village entrances and focal points (4) Community involvement e.g. design, planting and maintenance. Our first impression on entering the village was to see the Village sign and floral planter. We noted similar ones at each entrance to the village. 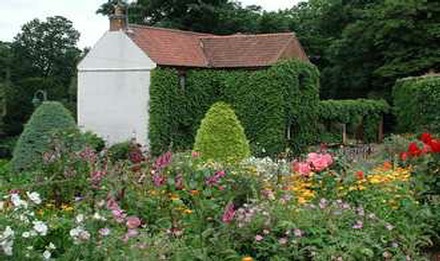 We noted many attractive domestic gardens and the hugely colourful Four Bells Hotel. The new Ploughman Avenue floral bed you have created is a credit to you all. Total points available for Section A - 60. Points awarded - 43. Section B - Permanent landscaping, including shrubs. 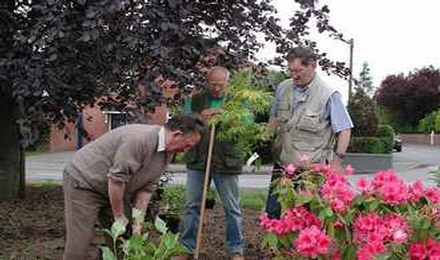 (1) Functional areas (other than streets), open spaces and verges (2) Residential areas, commercial premises and village focal points (3) Community involvement including tree and roadside planting, design and maintenance. Your portfolio showed some very nice spring planting as well as autumn flowering shrubs. We liked the unusual muscari roadside border on Shelt Hill. The trees in and around The Governors' Field were very attractive. Total points available for Section B - 60. Points awarded - 45. Section C - Sustainable development. (1) Nature conservation projects, monitoring, education and work programmes. Other nature projects - designated areas for creation and understanding of wild flowers/life (2) Waste prevention such as recycling, composting (3) Community involvement to improve the environment and projects to encourage saving natural resources. Your activity in this section is worthy of review. For example you showed us the areas in the cemetery that have been left uncut. Maybe you should consider creating an extended managed wildflower area here. Section D - Local environmental quality. (1) Cleanliness of streets/shopping areas and gap sites including litter, dog fouling, graffiti, fly-posting and vandalism. Cleanliness of functional areas (anything other than streets) and recycling sites. 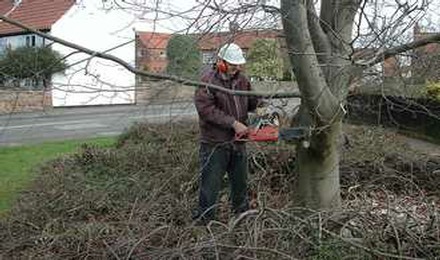 Weeds, condition of hard landscaping and street furniture, condition of litter and dog bins and management of gap sites. (2) Community involvement, including campaigns and community projects resulting in improved cleanliness. Keep up the good work here, but we suggest you try to push for something positive to happen to the boarded up shop. Total points awarded for Section D - 30. Points awarded - 22. Section E - Public awareness. 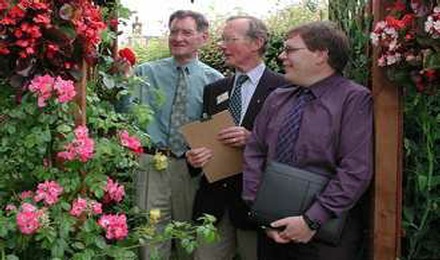 (1) Publicity and promotion of Britain in Bloom, communication of informal, fund raising, sponsorship/benefits in kind (or other support), and media coverage. Your introductory video was a novel idea giving us a good impression of your community life. We were impressed by the way you are enlisting help from volunteers in the village and raising sponsorship. This can be another measure of your success. Total points awarded for Section E - 20. Points awarded - 15.
maximum available of 200, in this our first attempt.